“Just let go of old behavior and attitudes when they’re not working and try something new.” That should be easy, right? Well, maybe it should be easy, but for most of us, it isn’t. Many of us have lots of learning, degrees, and practice piled high on our mental and behavioral “resumes.” We are invested in how we think about and do things, and it can be very challenging to change course. It can be even more difficult when our experience worked for us before, at least well enough. But if it’s not working now, we eventually realize it. Even so, affronts to our pride may attach to our intellectual and emotional habits. Together, they can create a mighty force and a big wall of resistance. That resistance may or may not be conscious, but either way it can turn into a major road block that’s in the way of being successful now. Valiant leaders do try new things. They have the courage and fortitude to be novices again. This is not easy. When we are in positions of leadership and people look to us for answers and expertise, it can be difficult to step away from our comfort zone and people’s expectations of how we will lead. Valiant leaders will do just that when outside circumstances or internal stirrings call for a fresh approach. 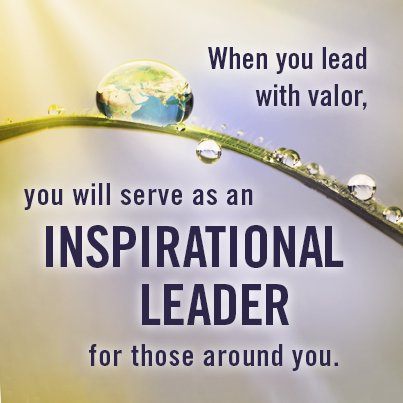 Leadership valor is not just about being consistent. It is not just about doing what other people expect. It is also not about taking a big stand when we are sure we are right, and we have the polish and verbal ability to defend it. Leadership valor is about being human, and being willing to let go of behaviors and attitudes that no longer serve us or others. It is about being honest enough to admit – at least to ourselves – that our go-to approach is not best now. It is being humble and vulnerable enough to step away from old habits and expectations. It is being brave – and valiant – enough to step into behaviors or approaches that better fit today’s reality, even if they are new and untried. This entry was posted in Blog and tagged Attitude, Behavior, Change, Courage, Habits, Healthcare, Leader, Leaders, Leadership, Success. Bookmark the permalink.